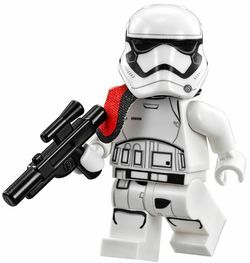 The First Order Stormtrooper Officer is a Star Wars minifigure released in 2015. The First Order Stormtrooper Officer has a plain white leg piece, with black printing on the legs to outline armour plating on the knees and for depicting a gap in the armour revealing black undersuit towards the top of the inside of the legs. Additionally, the bottom of an ammunition pack is printed on towards the top of the right leg, while the top is continued on the leg joint, which is predominantly black for a belt, but with two other white rectangles also printed. The legs and leg joint are further detailed with grey printing. This minifigure's upper body piece is white, with printing on the front and back of the piece. On the front, black areas are present near the head and arm joints representing the black undersuit, and the chest plate is outlined in grey, dark grey and black. On the right-hand side of the chest piece are six small black ovals. Under the chest plate are boxes outlined in dark grey, with further armour outlining in grey. The back side of the piece has a similar colour scheme, and a dark grey circle with black outlining is printed on the left-hand side of the back plate, while two white ovals with grey outlining are on the right. Underneath the back plate, a black and white thermal detonator attached to a mounting plate is depicted. A flesh-coloured head is used, with black eyes with white pupils, downturned black eyebrows, a clenched mouth outlined in black showing white teeth, and a darker flesh colour used for detailing the cheekbones, chin and a crease between the eyebrows. The First Order Stormtrooper Officer comes with three accessories. The helmet has a mould specially designed for First Order Stormtroopers, and uses dark grey printing for outlining and detailing areas around the ear areas. Seven lines on each side of the helmet for filtration vents are printed in grey, as is a circular area on the bottom-left part of the helmet which has detailing in dark grey. A narrow black trapezium is printed underneath the ear areas, However, perhaps the most distinctive part of the helmet is the large black area for the visor and mouth grille. This minifigure also comes armed with a black blaster piece, and also has a cloth black and red officer's pauldron, which is attached between the neck and head, and worn over the right shoulder. 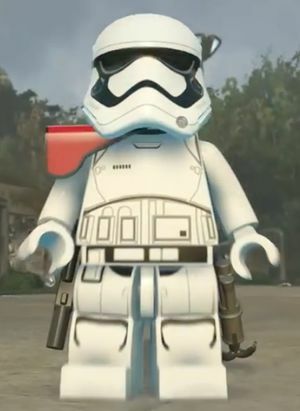 The First Order Stormtrooper Officer in LEGO Star Wars: The Force Awakens. Stormtroopers of the First Order were trained from birth and were given one purpose in life- to serve the First Order. In additional to combat training which encouraged improvisation on the battlefield, stormtroopers received medical training treating blaster wounds. Troopers were exposed to a constant stream of pro-Imperial propaganda for behavioural and personality conditioning, ensuring a stormtrooper's loyalty to the First Order. The stormtroopers saw action in First Order missions, including battles against Resistance forces on Jakku and Takodana. To indicate their high rank, Stormtroopers ranked above sergeant wore red pauldrons. A Stormtrooper Officer with helmet and pauldron removed, and a back view of the minifigure with pauldron removed. Facts about "First Order Stormtrooper Officer"
This page was last edited on 6 July 2016, at 08:33.